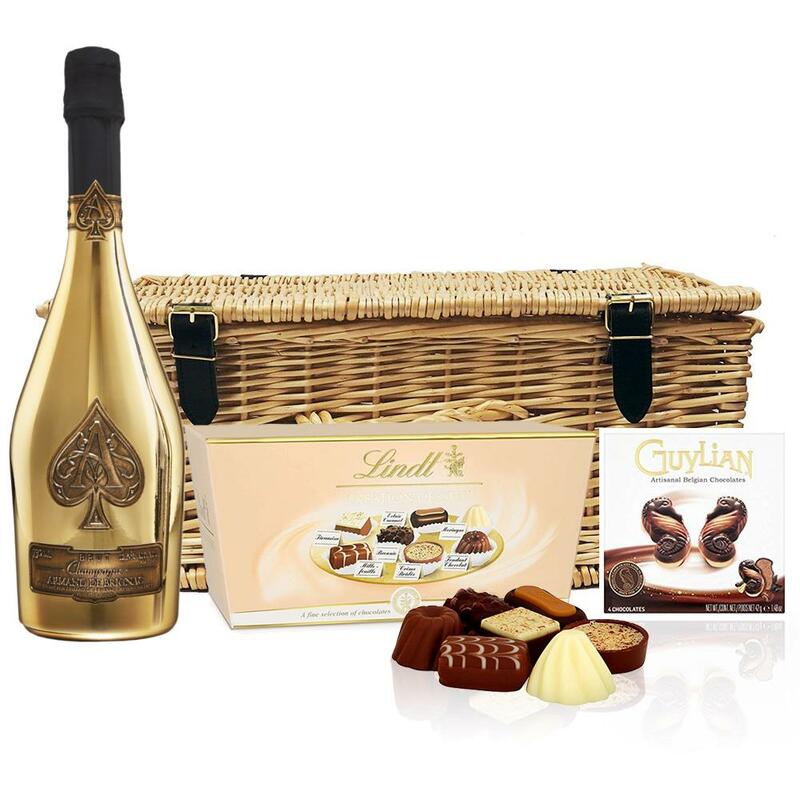 A delightful gift of Armand de Brignac Brut Gold 75cl along with a box of Guylian Artisanal Belgian Chocolate Hearts 42g and Belgid'Or Fine Belgin Chocolates (175g) all packed in a wicker hamper with leather straps lined with wood wool. All gifts come with a gift card with a message of your choice. Armand de Brignac Brut Gold 75cl in Branded Box - Armand de Brignacs unmistakable gold-plated bottle has its roots in the French fashion industry and its reputation for opulence. Originally conceived by the celebrated Andre Courreges fashion house, the striking bottle is decorated at a single site in Frances Cognac region and is fitted with four pewter labels that are hand-applied to the surface of the bottle. Armand de Brignac is a Prestige Cuvee produced in the traditional, old-world style, from grape to glass. 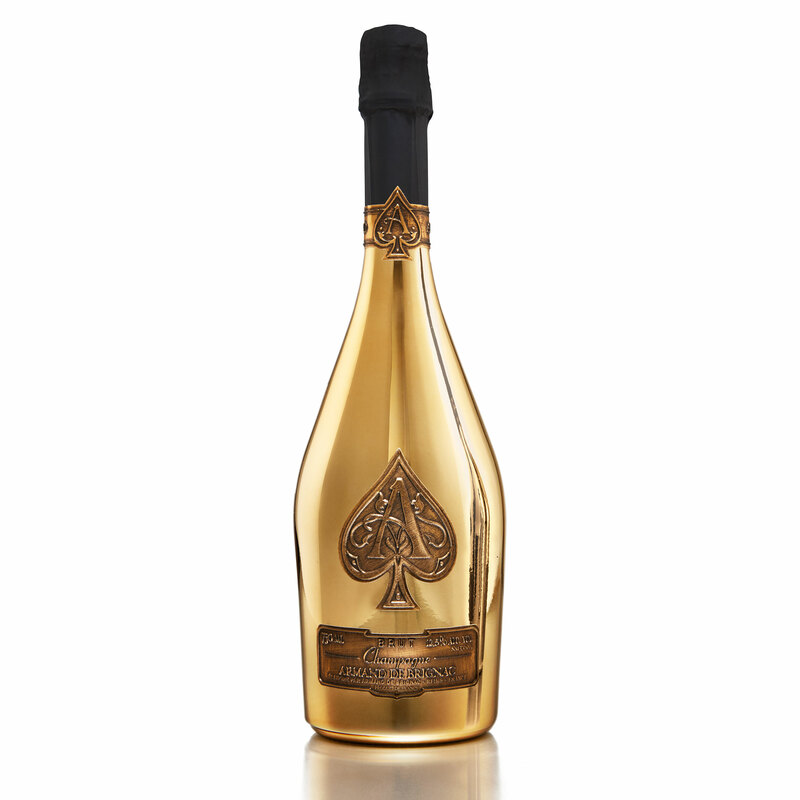 The Brut Gold also known as ACE OF SPADES is pressed from a perfectly balanced blend containing Chardonnay, Pinot Noir and Pinot Meunier wine. On the palate, Armand de Brignac has a sumptuous, racy fruit character that is perfectly integrated with the wines subtle brioche accents. The Champagnes texture is deliciously creamy, with great depth paired with a long, silky finish. This product is hand packed onsite by Gifts International, and is not affiliated with any other brand. Gifts International is responsible for this product combination/set.